You’ve Been Hit by an Uninsured Motorist – Now what? The expectation is, due to legality, that everyone on the road is insured. Unfortunately, that isn’t always the case. 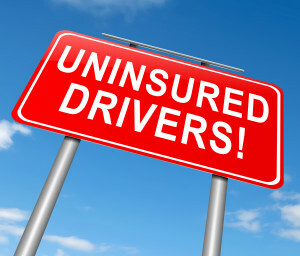 Uninsured drivers exist in virtually every state. Though the reasons may vary as to why they choose not to or are unable to purchase insurance, the result is the same. If they are involved in an automobile accident the other party involved has to be able to pick up the slack and cover the damages as well as the liability. Uninsured motorist insurance covers your medical bills and wage loss that starts when the $10,000 PIP (Personal Injury Protection) maxes out and the at-fault driver was carrying no insurance at the time of an accident. Only a percentage of drivers opt to carry bodily injury coverage. The standard PIP many times does not cover the accumulated medical bills. This creates an issue not only for totally uninsured drivers but also with many underinsured as well. Drivers without insurance generally are not prime candidates financially to bother filing suit against. Instead you would file a claim against your own auto insurance coverage up to the limit of your uninsured driver policy. As far as underinsured drivers involved in an accident, they are categorized as such because they have elected coverage that falls short of covering your inflicted damages and or injuries. Uninsured and underinsured driver insurance coverages can only meet and match your own liability coverage, they cannot exceed it. An option that can help if you have more than one vehicle insured is to “stack” coverage in an amount equal to your bodily injury liability coverage. Stacking coverage increases in amount for each vehicle you have on your policy. This option doesn’t add much cost to your premium and can greatly increase the value of your coverage. In the new study Uninsured Motorists, 2014 Edition, the IRC (Insurance Research Council) estimates the percentage of uninsured drivers Florida has among the highest estimated uninsured motorists anywhere in the United States. It was estimated for 2014 that Florida had 3.2 million uninsured drivers on the roads (between 15-26%). According to the Statistic Brain Institute in 2013, the percentage of accidents caused by uninsured motorists was 14% with 40% of uninsured cars being of models 15 years or older. So watch out especially for late model cars on the roads. The best way to determine the right coverage is to talk to a qualified Insurance agent who can customize a policy quote specific to your needs. Centennial Insurance Services is an independent agency which is able to assist with all of your insurance needs be it personal or business. With over 15 years’ experience in the industry they are able to do the leg work for you and eliminate the need for guessing. Give them a call today 239-247-5125 in Fort Myers, FL 904-598-1036 in Jacksonville, FL or visit http://www.cisinsfl.com/ for your free no obligation customized quote.